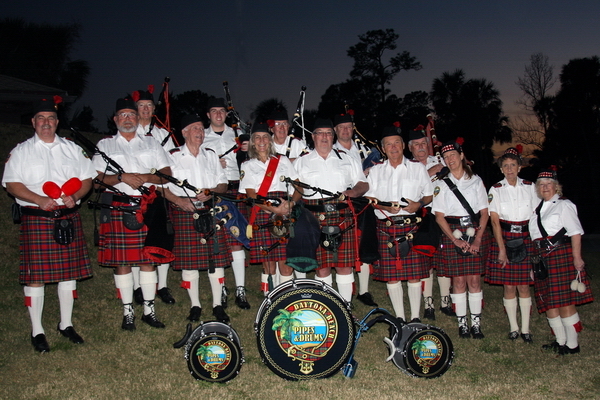 The Daytona Beach Pipes and Drums are an eclectic group ranging in ages 19 to 93 (5 Women and 19 Men) coming from all over the United States, Canada, and Scotland (From that perspective you could say we are an International group). Their oldest memnber was in the Battle of the Bulge and our youngest is an ROTC student at Embry Riddle. Our Pipe Major is a Female Assistant Professor at Embry Riddle, a retired Commander in the U.S. Navy and one of the first female combat pilots in the Country. Many are snowbirds that join us in the Winter and many play in other pipe bands. Irish or Scottish ancestry is not a requirement to learn the Pipes or Drums. We have 6 drummers and 18 Pipers (Including Pipers in training). Our mission is to support and promote Celtic culture and heritage.